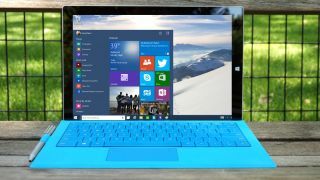 If you enjoyed viewing videos and photos on the Surface Pro 3, you're going to love what Microsoft has in store for the Surface Pro 4. First reported by WinBeta, the upcoming Surface Pro 4 will have an incredibly thin bezel around the edge of the display that mimics the set-up found on the Dell XPS 13. The sources quoted in the article claim that bezel will be so thin that it will be almost non-existent on the top and sides, and will only be noticeable at the bottom of the tablet-PC hybrid. Something else mentioned in the report is a "smart frame" that changes state depending on how the device is being used. It's claimed that this will see the frame sit at around 13-inches when in laptop mode and then shrink to 12-inches in tablet state. I guess we'll have to wait for the product to be released to see if and how that works. Most of the specifications out there at the moment agree that it will be the same 12-inch form factor as its predecessor, mostly because Microsoft wants it to be compatible with the previous generation of accessories. It is still unclear whether the new hybrid will get an Intel Skylake Core M chip, or the more powerful Core i series. Less solid rumors have alluded to the possibility of a 14-inch Surface Pro 4 to take on the Apple iPad Pro. This would have a powerful spec sheet including a 4K resolution screen, up to 16GB of RAM and come with a price tag of $1,300 (about £830, AU$1762). With Dell also bringing a challenger to the table, the tablet-PC hybrid battleground is ready to get rumbling. The rumor mill surrounding the Surface Pro 4 has been rolling along for some time and everyone's expecting Microsoft to perform the big reveal at an event on October 6.